Back in the 1950’s a movie character in a sci-fi film was just that, a character, one persona which was fixed throughout the movie. Fast forward fifty years and things have shifted a bit, and there is a fluidity to characters. With the utilization of digital effects in movies, “shape shifters” or “changlings”, beings that can instantly transform themselves, have become commonplace. One minute the shape shifter is a humanoid, and the next an animal of some sort. It all adds fun and mystery to the sci-fi genre. There’s been a bit of fun and mystery added to the audiophile’s experience over the years, too. The ardent fan of two-channel in years past might pony up some serious cash to obtain good tube performance in audio. Two-chassis designs were often the answer, although meaning two price tags. By and large, the components produced a fixed sonic signature. Each piece had its limitations, and if you wanted to alter the sound more than tweaking it by changing some tubes or cables, you had to go hunting for a new component. No longer, not when there are shape shifters, components with such fluidity, and potential to sound good in an entire range of operational settings, that they would fit into any system. 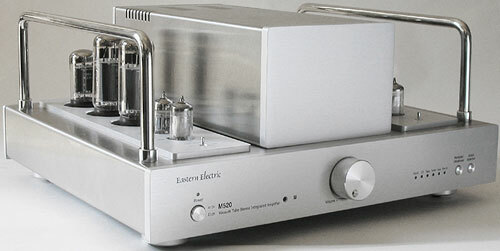 That is precisely what the Eastern Electric M520 does; it comes into your home looking like a well-built, well laid-out integrated created for utilization of some of the most loved tubes of the past 50 years, and it nestles into your system with such ease that you’ll feel it was made for it. If ever there was an integrated built for flexibility, the M520 is it. Alex Yeung, the creator (remember Star Trek episode #37, “The Changeling” in which a probe named Nomad mistakes captain Kirk for it’s creator?) of the M520, made no mistake in his utilization of tubes (per channel): 5AR4 rectifier, EF86 first driver stage, 12AU7’s as the preamplifier splitter, and a pair of EL34’s. All of these are attractively ensconced on top of the silver brushed steel-and-aluminum chassis. Two generous handles sit astride the sides of the unit allowing for easy portability. This is appreciated since having to move the approximately 55 lb. amp by picking it up underneath would potentially lead to brushing tubes against one’s chest, opening up the possibility of harm to tubes or sockets. 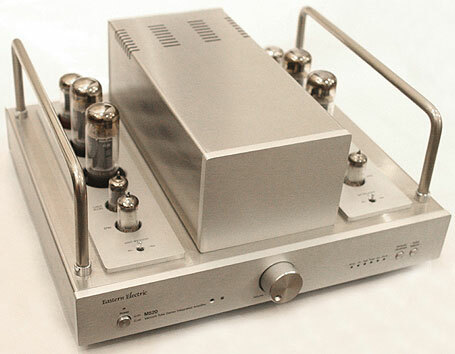 Upon startup, the amp is muted for 30 seconds while the tubes warm up; the LED then remains solid and the CD indicator is lit. There is an ever so slight hiss that leaks through the speakers and can be heard from 1-2 feet away, but it is completely inaudible at my listening position twelve feet away. The noise is negligible; I have heard similar tube effects in separates costing five times the amount of the M520. Indicators are cleanly displayed via LED’s: blue for power, green for volume and input, red for pentode mode, and yellow for ultra linear mode. These functions are also found on the matching remote, which is intuitive and uncluttered. On top of the chassis, on both sides of the tower housing the transformer(s), each tube type is clearly marked at the socket along with optional replacements for the rectifier (GZ34) and splitter (ECC82). There are inputs for CD, TAPE, TUNER, AUX, as well as PRE INPUT and TAPE OUT. The M520 can operate solely as power amp by selecting the PRE-IN button on the remote control. The MUTE button is located on the remote. The amp generates heat, but not nearly on the order of some tube power amps. Nevertheless, this is not a unit that should be put anywhere within reach of small hands. Two functions of the M520 which are indispensable to tailoring sound are the NFB (Negative Feed Back) switch, and the choice of either 8 or 16 ohm poles for output. The manual suggests that 6 or 8 ohm speakers be connected to the 16 ohm poles, and 4 ohm speakers be connected to the 8 ohm poles. Because this amp is a “shape shifter”, it can be easy to misjudge it. If a purchaser enamored of the idea of owning a tube amp with lots of glowing orbs on it, buys the M520 without a care to tube rolling or working with the parameters of the outputs, the pentode/UL mode, or the NFB switch, he may draw a wrong conclusion – that the sound they are hearing is all the M520 can produce. If they don’t happen to think that sound is to their liking, they’d be tempted to dismiss the amp as not up to their expectations. Big mistake! This amp can morph its sound and do so at a fundamental level. It’s not stuck in pentode or ultra linear mode. It’s not fixed at 8 ohms output. It’s not eternally a zero feedback amp. It’s any of the above. Therein lies the beauty of the shape shifter; its essence is that it can be all things to all people. No, this amp won’t be the ultimate in power, the end-all in detail, or the last word in dynamics, but the M520 will make a Herculean effort in all those categories, and will do so with the flick of a switch or the push of a button. One minute, it can be a more ethereal-sounding ultra-linear, and the next it can be a pentode amp with maximum feedback to take control of the bottom-end. That chameleon-like adaptability is wonderful! Toss in tube rolling and the amp has a makings of an audio Rubik’s cube; seemingly endless possibilities. The question of what particular sound you will enjoy from the M520 comes down to two basic quantifiable attributes but also subjective perceptions: power and distortion. Don’t get a knee jerk reaction when I say distortion, since all electronics possess it to one degree or another. When I say distortion as a “quality” of the sound, I mean its existence as an artifact of the choice of mode in which the amp is operated. If the M520 is operated in ultra-linear mode, there is more of an open/spacey sound to the instruments. The treble and bass become less distinct with a millisecond of echo-like afterglow. This is not an accident, it is the way a signal sounds when sent through the M520 acting as an ultra linear amp. It can be a very pleasing sound, and many individuals are drawn to this kind of sound. With the proper crossover-less speaker, it may be your ticket to paradise. Conversely, move the NFB selector to the “max” setting, where there will be more damping control over the speakers’ drivers, and instantly the presentation crisps up, the bass is more distinct, the treble most sparkling. But some of the gorgeous openness and “air” of the midrange accentuated in the ultra-linear mode will be sacrificed. Hence, from the inherent difficulties of being a shape shifter, this amp cannot be all things at the same time. No tube amp can simultaneously operate in ultra-linear operation and pentode operation, or zero feedback and positive feedback at the same time. Whereas many amps give you no options, and you get what they consider good sound, the M520 gives you options aplenty. Want an expansive soundstage with an accentuated midrange? Set the NFB switch to zero, or for even more of the same, you can move it to the negative position. Want a dynamically tempered presentation which seamlessly integrates the instruments? Take your 4 ohm speakers off the 8 ohm poles and put them onto the 16 ohm poles. You will lose some of the dynamic punch but will gain an evenness across the sound spectrum that may appeal. The Pentode/Ultra Linear operation, as well as the NFB switch, can be operated while listening. There is a distinct pop as the unit switches between Pentode and UL, and the volume changes slightly as one moves the NFB switch to the zero feedback position. I recommend lowering the volume when making this adjustment. As tube rolling is added, things get downright personalized. If ever there was an amp that could make you feel it’s your very own, it’s this one, because the likelihood that many people out there are using the same output poles, the same NFB setting, and the same tube configuration is slim. One advantage to all this adaptability is that the need to hunt for the “perfect” speakers to compliment the amp is obviated. This amp will mate up nicely with just about any class B or higher speakers. It is so flexible that you can quite literally move it from a vinyl rig with floor standers to a solid-state system with monitors and it will complement both. All you need to do is shift the settings a bit and it will fit right in.